"Shipping of radioactive materials into/outside the CERN premises"
The Radiation Protection Group assists the Logistic Services GS/IS in organising the shipping of all radioactive material from CERN to other institutes or external organisations, for the radiation protection issue. The Radiation Protection Group also assists the Logistic Services GS/IS to check on reception all radioactive materials that arrive on CERN’s sites from external organisations. Any person wishing to ship or import radioactive materials must contact the Radiation Protection Service RP beforehand, as well as the Logistic Services GS/IS for urgent requests. 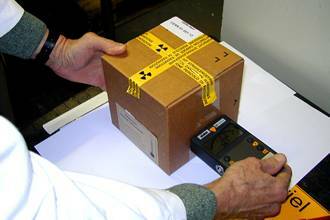 Export of radioactive material, click here. 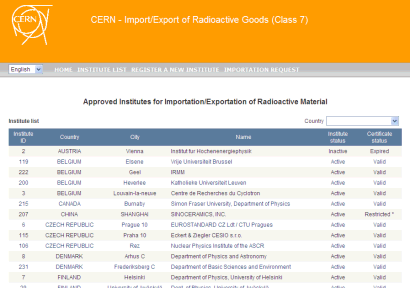 Import of radioactive material, click here. Contact the person in charge of radiation protection in the zone from where the shipping is to take place. Check that the institute is listed in the database. The applicant must then fill in a form in order to provide the various elements necessary so that the institute or organisation can be registered with CERN as an institute or organisation entitled to receive and handle radioactive substances. (*) A Licence/Certificate = paper delivered by your national authorities, stating that you are authorised to import/export/work/handle radioactive material. If the licence is out-of-date, check with service-rp-shipping@cern.ch (or 62717) the reason (generally registered in our database). It may happen that the applicant have to ask the addressee institute or organisation for a new licence and use the form to register the new certificate. Fill in the EDH request form for the transport of radioactive material. For all "permanent duration" shipping request, please attach a proof of ownership (will be systematically required and is mandatory). -1- The exact address of where the material is to be dispatched from (and not the address of the shipper). -3- Specify your requirements in terms of transport (in general, external AND internal). Once the EDH request form has been filled in, bring the radioactive material to the Radioactive Material Transport Service of the Radiation Protection Group: building 24/E-024 at least 3 days beforehand so that a measurement by gamma spectrometry can be carried out. It is imperative that the material be accompanied by the most precise description possible, as well as the EDH document request number. If the object’s level of radioactivity is too high, there is the possibility that the material could be removed by an RP staff. If the material is too cumbersome to be transported, an appointment will be made with a member of the Service, so that a sample of the material to be sent can be taken. A measurement by gamma spectrometry will then be carried out on the sample, or possibly in-situ using a portable detector. ISOLDE collection (short half-life): click here. ISOLDE collection (long half-life): click here. N_TOF Water (250 ml): click here. Once the results of the gamma spectrometry is known, an email is sent by our Service to the addressee institute’s Radiation Protection Safety Officer (RSO), who must give his/her approval for receiving the material. Until a reply is received by CERN’s Radiation Protection Service (Radioactive Shipping Service), the material cannot leave CERN. Once the reply is received, the parcel (according to the size of the material) is taken care of by our Service and shipping can take place (if the material is voluminous, the applicant must contact the Logistic Services GS/IS for packaging it). Shipping are done under CERN responsibility in agreement with ADR/IATA/IMDG regulations. For this reason, only entitled carrier and commissioned by CERN are authorised (no institute/private car allowed). For all questions related to delivery time / schedule / freight company, please contact Logistic Services GS/IS. 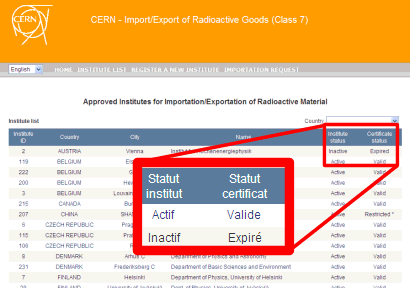 The shipment of radioactive goods to CERN is not allowed, unless a written "ready-to-receive" approval by a CERN transport officer is given. Therefore an intended consignment of radioactive materials, sources or packages to CERN have to be announced in advance to our service. In all cases, the import of the radioactive materials must be made in strict compliance with the international rules in force for the transport of dangerous goods, under the responsibility of the sender and in liaison with the Radiation Protection Service of the sender’s organisation. Import can start only after agreement of CERN Radiation Protection Service. 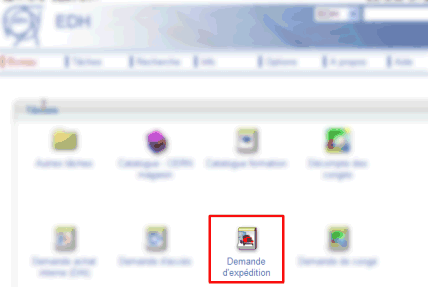 Prévessin site: Be careful: under temporary restrictions, please contact +41 22 766.27.17 in advance to foresee any problem. Please take note that CERN can not play the role of a gateway for radioactive shipping. The shipping must be done from consignor to consignee without passing through CERN area.